A state funeral was organized and held in Cairo’s Nasr City for the 24 people killed in the deadly Cairo Cathedral terror attack on Sunday. 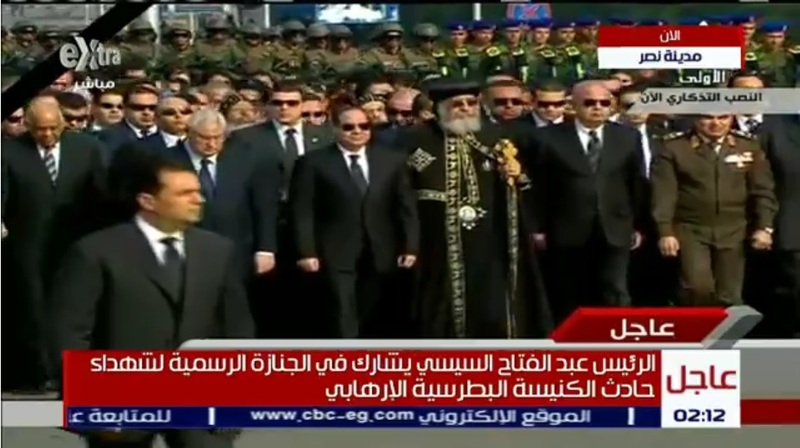 The state funeral, which was preceded by a funeral service conducted by Coptic Pope Tawadros II at the Church of Virgin Mary, was attended by Egyptian President Abdel Fattah Al-Sisi, Pope Tawadros II, and a large number of top Egyptian government and religious officials. The event, which was organized by the Egyptian Armed Forces and was held amid tight security, took place at the Tomb of the Unknown Soldier in Nasr City. Coffins of the victims, draped with Egyptian flags, were transported to the state funeral after the church funeral service and were marched down the Autostrad by Egyptian soldiers holding wreaths. Following the coffins and soldiers, Egyptian officials, led by the Egyptian President and the Coptic Pope, were followed by family members and other mourners. Following the march, President Sisi shook hands with some mourners and sent his condolences. At the earlier funeral service, Pope Tawadros II said that the terror attack was not against the church but against all of Egypt. “Whoever did this attack does not belong to the Egyptian people,” said the Coptic Pope after the funeral service. Tensions were high outside the funeral service, with security forces preventing non-family members from entering the church, citing concerns of overcrowding. Crowds of protesters outside were heard chanting in solidarity with those killed. Some chants were also heard urging justice and calling for government officials to be held accountable. Similar scenes were witnessed following the bombing on Sunday, with hundreds of protesters converging outside the Cathedral to demonstrate and to remember those killed. Sunday’s attack, which took place on an Islamic holiday, was one of the deadliest against civilians in recent years. Egyptian President Sisi declared three days of mourning following the attack and promised the perpetrators would be brought to justice.